I think these kickoff cookies fit the bill! I love that they were so easy to put together. I simply mixed up the sugar cookie dough, along with some royal icing. 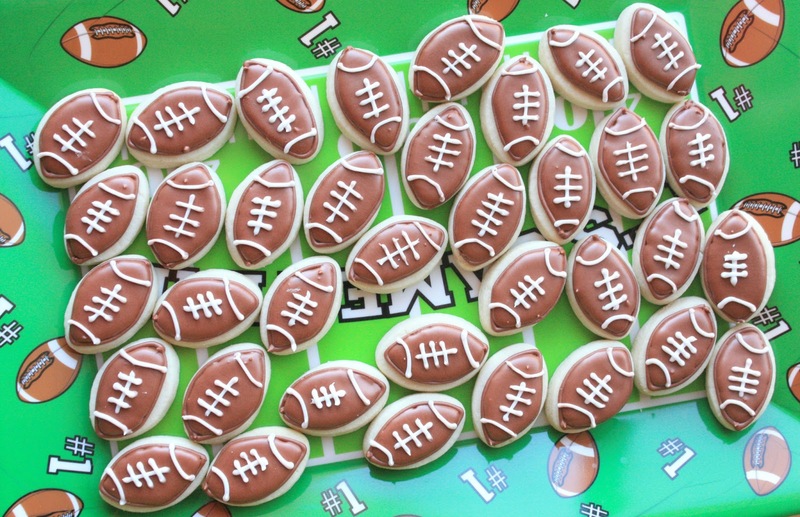 The footballs were made using a petit four cutter from this set. I also used a small round cutter for the patch of grass cookie. The grass was made with some thickened royal icing, tinted green (Wilton leaf green), and applied with a #233 Wilton grass tip. After the grass was applied, I immediately pushed a football (royal icing tinted with AmeriColor Chocolate brown) vertically into the middle, held it for a couple of seconds, and then it stayed put on its own. I made three dozen in no time at all! After all the chips, dips and chicken wings, these little cookie bites are just the right amount of sweet! Mini cookies are not the easiest to decorate. I love what you did here and especially the little stand up footballs on the grass. Adorable. 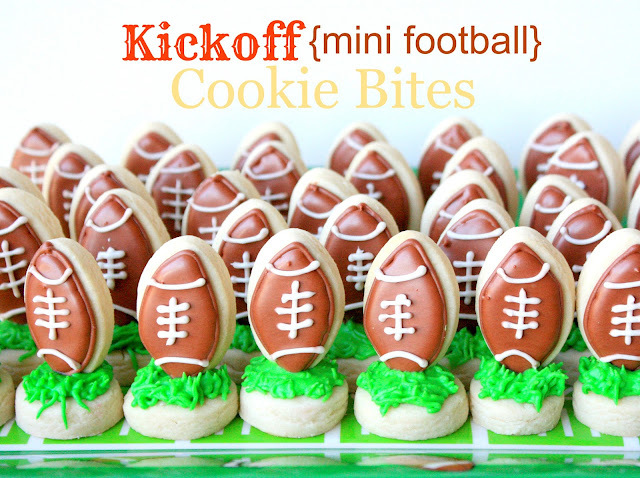 Sue - these are sooo cute - I love how they stand up, all ready for kick off!! They will be gobbled up before the coin toss! OMG, so cute!! Seriously, Sue, these are just adorable and I love how easy they are. PERFECT for football season! Darling!! Love, love, love them! Too cute. Have to make these. These totally remind me of Charlie Brown and Lucy. So cute. Pinning. best idea ever Sue!! so cute and fun!! These are the cutest footballs I have ever seen! Since the Giants aren't in it, I'm not as excited as I was last year, but I wish I could order dozens of these! What a fantastic idea, they are so cute. Aw so cute and bite sized perfect! 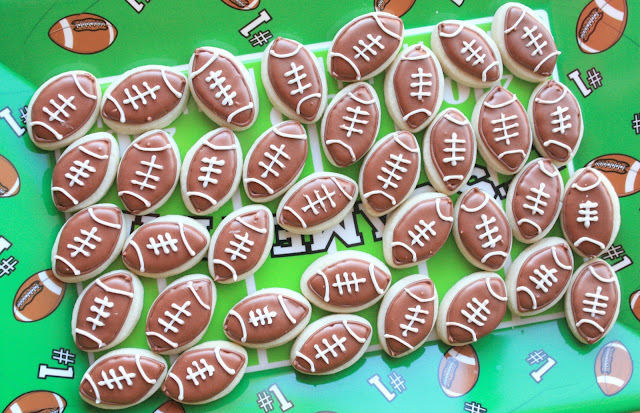 I love these - very perfect for a super bowl get together. These are too cute to eat! Thanks so much for linking up over at Finding the Pretty & Delicious. Hope you will stop by again tomorrow! Love those cookies! They'd be perfect for a Super Bowl party. These are the cutest cookies I've seen in a long time! How creative! 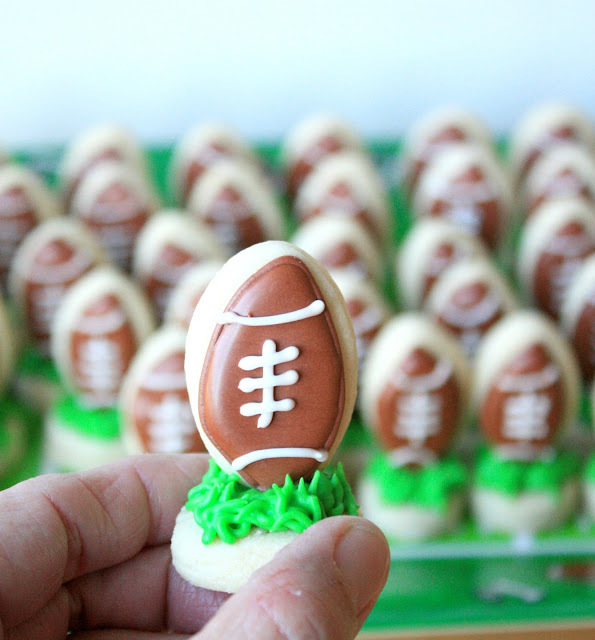 I never can get inspired when it comes to football cookies. Although, my team is in it this year, so I might just have to make some 49er cookies for the guys! You are the best Sue!